On Sunday night, Democratic presidential nominee Hillary Clinton faced off against Republican nominee Donald Trump in the second presidential debate. The tone of the evening was set immediately when Clinton and Trump did not shake hands at center stage to start the event. 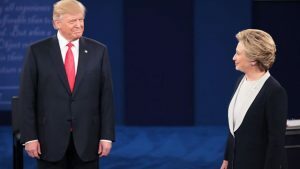 The debate take a dark turn early as Trump sent a volley of harsh charges at Clinton, claiming she had attacked women who had accused Bill Clinton of sexual abuse and promised to send her to jail if he was elected president. Free falling in the public eye following the release of a video from 2005 that show him bragging crudely about being able to force himself on women, Trump looked to salvage his campaign through taking the offensive. He interrupted Clinton repeatedly. He spoke negatively about her domestic and foreign policies and questioned her character and judgment. He said she was the Devil and a liar. Clinton, while restrained for the most part, showed some flashes of anger toward her aggressor. She told Trump at one point that he was just creating a diversion to avoid discussing his campaign and how it was exploding as Republicans started to end their support for him. With the GOP in a crisis that is unprecedented, and dozens of officials in the party calling for Trump to step down, the isolation of Trump was opened up clearly on stage when he curtly broke with his running mate for vice president Mike Pence on a central issue of foreign policy. Pence has said that Russia is a menace over in the Middle East, but Trump said he did not agree and that the two had not talked about Russia’s role in the civil war in Syria. Clinton too had to address leaks of the paid speeches she made to firms on Wall Street and the investigation of the use of her email server while secretary of state. At times, Trump seemed energetic, but confusing, as he stitched together different talking points and evaded questions often, presenting a big contrast to the steady but sometimes halting presentation of Clinton. When Trump was asked about his video and if it described sexual assault, he said he was embarrassed about it, hated it but that is was just locker room talk and he was going to beat the hell out of the Islamic State. Clinton said Trump’s video spoke of exactly who Trump is. Her comments were dismissed by Trump and he unfurled a seething attack on her husband Bill Clinton who while in the audience was just stern faced. Trump said his were just words, while former president Clinton’s were action.